Days like today make me love my life. 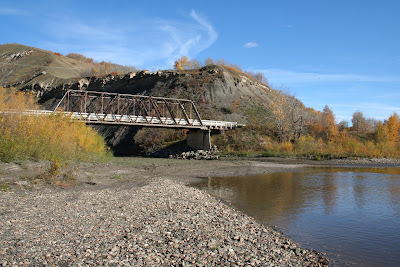 Knowing that the leaves won't be on the trees much longer - in a day or two they will be mostly on the ground - I loaded up the kids into the van, packed a picnic lunch, and invited my aunt to join us on a drive out to the Peace River, near Clayhurst, BC. It's about a 40 minute drive from my house, and we first made a stop at the Peace View Cemetery, a tiny little cemetery on the edge of the river hills. 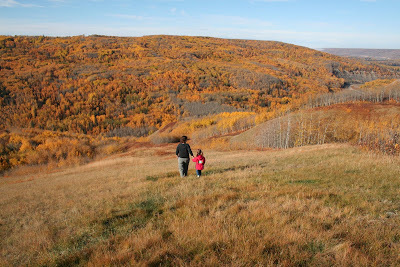 The colors were brilliant, the air crisp, and the kids pranced through the damp grasses while I searched for painting-worthy angles of the panorama before me. Kids don't need much - some sticks for digging in the mud, a wealth of smooth stones for throwing into the river to achieve the biggest splash, and a little sustenance when the fresh air wakes their appetites. We had a marvelous time, and it was a little bit hard to come back home for naps and see that I had missed taking my daughter to her optometrist appointment. That's okay though. I will call and apologize, and reschedule for a day when fall's gaudy display is just a memory and winter's palette of silver and cobalt graces the rolling hills of the Peace country. I love this land!